Senior business analysts and project managers who want to take their careers to the next level sometimes consider becoming consultants, offering their services—and wisdom—to many clients. Leaving the corporate world to become an independent consultant is exciting but also a bit scary. There is much to know about setting up the company, finding and working with clients, establishing business policies, and establishing yourself as a respected professional in your field. Since becoming a consultant more than 20 years ago, Karl Wiegers has found how to make it work. Karl wrote Successful Business Analysis Consulting to share what he—and others—have learned. With countless tips for making your consulting more effective and your business more lucrative, it's the book he wanted to have when he got started. 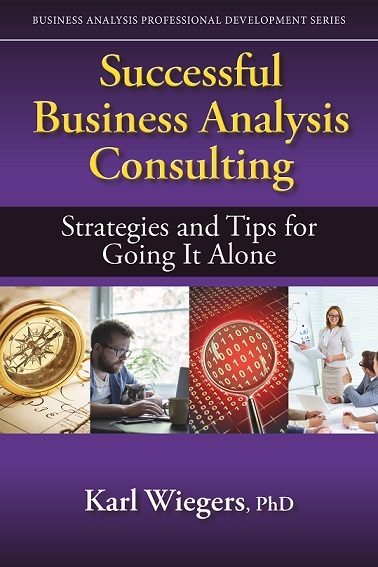 Successful Business Analysis Consulting has 35 chapters in 6 parts: Setting Up Shop, On the Job, Practicalities, Building the Business, Media Matters, and Writing Your Way to Success. Written in a conversational and entertaining style, it covers countless practical issues for both new and seasoned consultants. Karl draws from his extensive experience as a consultant, speaker, trainer, and author. Guest chapters from other consultants bring additional perspectives. Dozens of personal anecdotes make it all real. If you have questions about setting prices, negotiating agreements, dealing with difficult clients, partnering with other consultants, or generating revenue while you sleep, this book has answers. Whether you're just getting started or hoping to grow your business, Successful Business Analysis Consulting offers an abundance of practical advice for BA, PM, and other IT consultants. "Read it. Learn from it. Apply it. Getting a peek inside successful consulting like this reveals a true gold mine! Karl Wiegers outlines exactly what you need to do, and what decisions you need to make, to create a thriving consulting practice." "Successful Business Analysis Consulting is full of powerful advice. Even now, 20 years after first going independent, I learned a few things from this valuable resource. If you are a newly independent consultant or are contemplating it, this book has the advice you need to succeed." "I've looked to Karl Wiegers for business guidance for many years, and I'm thrilled to see him share these ideas in this interesting, practical, and to-the-point book. I'm not an independent consultant, but this book's breadth of topics reaches well beyond that audience. Whether you are a consultant, business owner, aspiring leader inside a professional services organization, or budding author, you will find value here." "Covers the broadest landscape of issues that you may encounter as a BA consultant with practical, down-to-earth advice to help navigate them. The action-provoking Next Steps at the end of each chapter compel you to behave differently based on that sage advice. Even after consulting for 15 years, I picked up a handful of valuable tips, and I have already applied a few!" "Successful Business Analysis Consulting provides fantastic practical guidance and insights. You will find this book of high value, whether you are a seasoned consultant or just starting to think about taking the plunge into running your own consulting practice." —Laura Paton, CBAP, PMP, PMI-PBA, Founder of BA Academy, Inc.
"Simply put, this is the book I wish I'd had available to me when I started consulting. It provides valuable advice on pretty well everything that touches on the consultant's life. It almost seems unfair! Karl Wiegers lets the reader in on the secrets that took the rest of us a lot of pain to learn. If you're starting out on your own, you couldn't do yourself a better favor than reading this book." "The mark of a successful self-help book is that it prompts readers to immediately help themselves. I have put a number of the author's suggestions into practice, some as soon as I read them in the book." "Oh, how I wish I had the resources in this book when I struck out to form my own company. This book is a treasure. But don't think you need to have your own consultancy to gain insights from this valuable work. Many chapters are beneficial even when one is working inside an organization, especially at the senior levels. Whether you are an independent business analyst, project manager, or other type of IT consultant, Karl's book is for you."